S Janaki is considered as “Daththu puthri” (Adopted Daughter)by malayalees . And so do the language by its own resides inside S Janaki. It was Malayalam and Kannada Cinema which welcomed and cherished S Janaki’s voice thoroughly. Soon after singing first Tamil and Telugu songs, Janaki made her debut in other languages like Malayalam, Kannada and Sinhalese.She did sing film songs in six languages in her very first year! With her inbuilt flair for languages and mind blowing grasping skills, it was always a bulls eye for S Janaki, The Singing StalWart. Janaki’s first song in Malayalam was for the movie ‘minnunathellaam ponnalla’ (1957/ Kerala Arts), recorded at the AVM studios. The song was ‘iruL mooduyagO en vaazhvil’, written by P.N. Dev and composed by S.N. Chami.S Janaki always remembers and mentions “she managed to learn the correct pronunciations of letters and words perfectly under the guidance of composers and lyricists” There were even instances where S Janaki went a step ahead to understand the composers mind and appropriately guide/correct the non-malayaali composer’s beats to retain the poetic imagination .Saarike song by Salilda in Swapnam movie.This shows the singers ardent interest in languages and how proficient Janaki started to become in Malayalam. 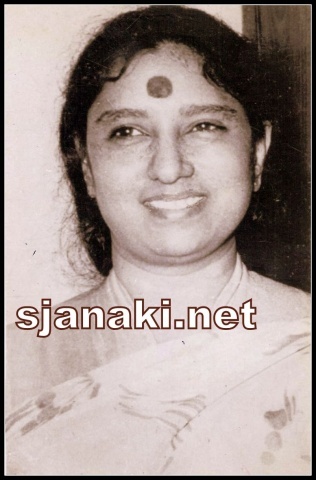 S Janaki has worked with almost all the stalwart music directors like M.B. Sreenivasan, K. Raghavan,B.A. Chidambaranath ,Brother Lakshmanan,LPR Varma,P.S. Diwakar and Ranganathan ,R.K. Shekhar,T.K. Pugazhendhi,R. Sudarsanam,Vijayabhaskar,Adoor Gopalakrishnan,Devarajan,Mohammad Sabir Baburaj,M.T. Vasudeva Nair,Laxmikant-Pyarelal, Salil Chowdhury,A. T. Ummer,M.S. Viswanathan,Shankar-Ganesh,Ilaiyaraja in Malayalam Cine Music. Awards were destined to this talented cuckoo in the state which adopted her. Malayalam industry respects S Janaki a lot .They honored with many awards for her superior talents. National Level Recognition was a added privilege . State Film awards Several times for Best Playback Singer from the Government of Kerala. 1981 – Best Female Playback Singer – (Song: “Ettumanoorambalathil”) Oppol, Malayalam Film- M B Sreenivasan Music Director. raakuyilE raakuyilE’ from the movie ‘minnal padayali’ (1959) ‘poovanamE pudhuvanamE’ ‘mangalam neruka’‘seetha’ (1960) ‘kadhayoNNu kEttu’ (Cochin Express/1967) ‘vidilla nyaan’ with Kamukara Purushothaman (Lady Doctor/1967) ‘padunna puzha’ (padunna puzha/1968) ‘vaikathashtami naaLil’ with Yesudas (bharyamaar sookshikkuka/1968) ‘kaNNil kaNNil nOkkiyirunnaal’ (Danger Biscuit/1969) ‘varumallo raavil priyathaman’,‘ee muhabathendoru’( Kanoor Deluxe/1969) ‘mOhamO dhaahamO’,‘raaja mallige’ ‘amrithavarshini’ with L.R. Eswari,‘kunnathE poomaram’ ‘ínnalE neeyoyoru’ and ‘kavitha paadi raakuyil’ ‘govardhanagiri kayiluyarthi’ (marunaattil oru malayali/1971) ‘valampiri sankhil’ (maya/1972) ‘oru chumbanam oru madhu chumbanam’ (driksakshi/1973) ‘abhinavajeevitha’ (poimukhankaL/1973) ‘aalOla neela viLochanangaL’ ‘chale chalicha’ ‘mullapoompallilO mukkuttikkavillilO’ ‘pournami chandrika’ (alakaL/1974) ‘manadhoru kavadiyattam’ (chumaduthangi/1975) ‘pulayanaar maNiyamma’ (prasadam/1976) ‘kothikallE kothikkallE rebecca’ ‘unarunaroo unni poovE unni poovE’ from ‘ammayE kaaNaan’ ‘tharil thararaO’ with K.P. Udhayabhanu ‘ellaam kazhinju thelinju’ (swarajyam) ‘oru vattam koodi’ (chillu/1982) ‘chirakkattu veenoru’ (pazhassiraja/ 1964) ‘panchavadiyil kaNdu kaNdoru’ ‘yethu poovu choodanum’, ‘kaniyanum vanilla’, ‘mullappoo thailamittu’-Remake of 1957 Tamil film MUthalaali in Malayalam ‘madhura prateekshathan’, ‘ethukoottil nee’(bhagya mudhra/1967) ‘sundara raavil chandana mukilil’ (kochu aniyathi/1971)-MD Pugazhendhi praised Janaki’s rendering of the line ‘anuragathin aadyanOmbaram’ in the song. ‘pookila nyorichu vachu’,‘unaru kaNNaa nee’ (kudumbam/1967) raareerO unni (kusrithi kuttan/1966) nizhalE nintE piravE (paadhira paattu/1967) ‘dEvan thannathu’ (kayalkarayil/1968) ‘kaaNaan nalla kinavukaL’(‘bhaarya’/ (1962)) ‘thaLiritta kinaakkaL’ (moodupadam/1963) ‘anjana kaNNezhuthi’ (thachOli othenan/1964) ‘pottatha peNNin kinaavu’ (bhargavi nilayam/1964) ‘amirtam pakarna raathri’(‘vidhi’ /(1967)) ‘sooryakanthi sooryakanthi’ (kaattu thulasi/1965) ‘thamara kumbilallO’ (anvEshichu kandethiyilla/1967) ‘maithO ghumguru’ (ninamaninja kalpadukaL/1963) ‘pathinEzhilyethiya paruvam’ (anju sundarikaL/1968) ‘yEzhu niRangaLumillathE’(‘karutha kai’/1964) ‘oru kochu swapnathil ’(tharavattamma/1966) ‘eeranuduthum kondambaram’,‘ambadikannanu mambazham’, ‘írukaNNeer thulikaL oru sundariyute’ and ‘vakacharthu kazhinjoru’(‘irittintE aathamavu’ /(1966)) ‘thamara kumbilallO’, ‘murivaalan kurangachan’ and ‘kavilathe kaNNeer kaNdu’ ( ‘anvEshichu kandEthiyilla’) ‘avidunen gaanam kElkaan’ (pareeksha/1967) ‘maanasa manivEnuvil’, ‘unarau vEgam nee’ and ‘mukilE viNNilaayum kaNNeeru’-‘moodal manju’ (1970) ‘mazhavil kodi kaavadi’,‘saarikE en saarikE’-‘swapnam’ (1973) ‘paraga surabhila kunkumam aNiyum’ (aalmaram/1969) mazhamukiloli vaman’ (aabhijathyam/1971) ‘raakEndhu kirangaL’- avaludE raavugaL (1978) ‘manathin muttathu’-‘karutha pournami’ ‘veeNa poovE’-jeevikkaan maRannupOya sthree (1974) ‘arama dEvathamaarE’-‘prabhu’ ‘oru naaL ullasa thirunaaL’ ‘paalaruvi paadivaru’-dhooram arikE (1980) OlangaL-Thumbi Vaa Some Insights on S Janaki . Producer T.E. Vasudevan decided to get the songs of his Prem Nazeer- Sheela starrer ‘moodal manju’ (1970) composed by Usha Khanna. P. Bhaskaran wrote the lyrics for the songs and Janaki traveled to Bombay where the songs were being recorded. Unfortunately, she fell ill immediately on arrival. However, Usha Khanna was determined that only Janaki should sing the songs, and ever the through professional, Janaki went to the studio. She remained lying on a couch in the recording theater, but when summoned, she did get up to sing and three solos were recorded one after another, without a single retake! The stunned Usha Khanna and her spellbound orchestra gave the singer a standing ovation, and Janaki responded with a wan smile before falling back exhaustedly on the couch. The three songs ‘maanasa manivEnuvil’, ‘unarau vEgam nee’ and ‘mukilE viNNilaayum kaNNeeru’ became immensely popular and find frequent airtime to this day. In a survey of the 12 most popular songs ever in the history of Malayalam cinema, Yesudas understandably swept the polls, with 8 solos and one duet with P. Leela making it in the final list. Janaki was the only other singer who made it to the top 12, with 3 of her solos, and two of them were composed by Baburaj- ‘sooryakanthi’ (kaattu thulasi) comes a valiant 3rd in the list of 12, while ‘thaLiritta kinaakkaL’ (moodupadam) makes it to the 8th position. This was a brief note on her wonderful innings in Malayalam Industry .Detailed Information to be updated soon !!! !